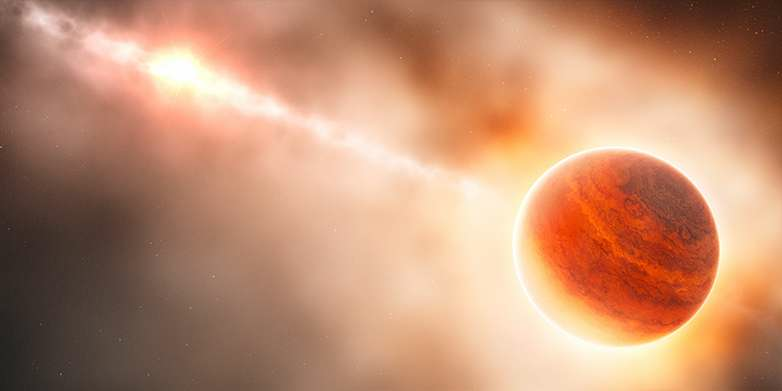 Astronomers at ETH Zurich have confirmed the existence of a young giant gas planet still embedded in the midst of the disk of gas and dust surrounding its parent star. For the first time, scientists are able to directly study the formation of a planet at a very early stage. Observing time at the European Southern Observatory (ESO) on Paranal Mountain is a very precious commodity - and yet the Very Large Telescope (VLT) in Chile spent an entire night with a high-resolution infrared camera pointed at a single object in the night sky. The data collected by the Naco optics instrument enabled an international team headed by ETH Zurich's Sascha Quanz to confirm its earlier hypothesis: that a young gas planet - presumed not unlike Jupiter in our own solar system - is orbiting the star designated HD 100546. At "just" 335 light years away, HD 100546 is one of our near cosmic neighbours, and its age of five to ten million years makes it relatively young in astronomical terms. Like many young stars, it is surrounded by a massive disk of gas and dust. The outer reaches of this disk are home to the protoplanet, which lies at a distance from its parent star that is some fifty times greater than the distance between the Earth and the Sun. The team first postulated the existence of this young planet in an initial research paper published back in 2013. At the time, however, the researchers were still debating another possible explanation for the data they had collected, namely that the observed object might be a more massive - albeit older - giant planet that had formed further inside the circumstellar disk before being hurled outward. "It's a scenario we still can't rule out completely," Quanz admits. "But it's much less likely than our explanation, which suggests that what we're seeing is the birth of a planet." If the object were an older planet that had formed earlier and closer to the star, its ejection trajectory would have to meet certain conditions for the researchers to be able to observe it now: It would have to be ejected directly in the plane of the gas and dust disk and at precisely the right time. "That would be a pretty huge coincidence," says Quanz. This is why the team prefers the more natural interpretation, which at any rate is unusual enough. In addition, their latest observations have convinced the researchers that the signal they are picking up cannot be coming from a background source. "The best explanation for the observed phenomena is that a new planet is actually in the process of formation, embedded in the disk surrounding its parent star" - that was the conclusion of the study, which is published in the Astrophysical Journal. The study was conducted within the framework of "PlanetS", one of Switzerland's National Centres of Competence in Research. Named HD 100546 b, the planet is the first object of its kind to be discovered. "It provides us with unique observational data on what happens when a gas giant is formed," Quanz says. Previously, scientists investigated how, where and when giant planets form in the disks surrounding young stars only in theory or using computer simulations. "Now we have a kind of 'laboratory' that can give us empirical data," Quanz explains. In the meantime, other astronomers have found two more young stars that appear to be harbouring young giant planets, although these seem to be in a somewhat later evolutionary phase as, thanks to their orbital motion, they have already cleared large gaps in the disks they are embedded in. No largely cleared gaps have been found in the vicinity of HD 100546 b. "Our object still seems to be surrounded by a lot of dust and gas," Quanz says. Besides the parent star's circumstellar disk, there may also be a smaller, circumplanetary disk encircling the newly formed planet from where matter is accreted onto the planet. Based on their observations in three different wavelength bands, the researchers were able to derive an initial estimate for the object's size and temperature. Their estimate puts the average temperature of the area - which has a diameter corresponding to seven times that of Jupiter's - at over 600 degrees Celsius. The fact that thermal radiation is emanating from such a large area suggests that its source is a combination of a young planet and a circumplanetary disk. Future observations using the Alma radio telescope in Chile's Atacama Desert should confirm whether or not the protoplanet is in fact encircled by its own disk, as well as provide indications regarding the disk's mass and size. And it's quite possible that HD 100546 may yet supply further insights: Based on earlier observations of the star, the astronomers suspect that there might be a second planet orbiting it. If so, it would be approximately five times closer to the star than HD 100546 b is. So the astronomers may even be able to observe the formation of several planets in a single system. However, the existence of the second, inner planet is yet to be confirmed. That would come as no surprise, though, as many of the almost 2,000 exoplanets discovered so far belong to multi-planetary systems - just like our solar system. Didn't you ever feel the warmth at the valve whenever you pumped a tire? Similarly whenever gravity pull and compress gases, the temperature will rise absorbing the energy generated by the gravity pull. So necessarily a forming gas giant will radiate heat. What is this grade 8? The level to learn the ideal gas law, oh yes that is about it! Let me guess; you are going to be there next year right? The basics of it is that as soon as the gravitational potential is twice the kinetic energy of the matter contained in a volume, this matter is trapped and bound to a gravitational well. In order to have a planet formation, a gravitational collapse of this volume of matter has to happen. The kinetic energy that is contained in this gravitational well prevents the gravitational collapse to happen but has the kinetic energy gets transformed into heat through friction and collision the energy of this system is dissipated trough IR radiation. As this process slowly augments the viscosity of the system so too is the speed of the collapse. At the final stage, when gravity finally has the upper hand and pulls this dusty volume in a distinct planetary sphere, a major heat buildup is bound to happen. Gravity is an after effect of condensed mass...not it's creator. Ok kiddo, I cannot wait to read your own explanation of this process... Give it your best shot!